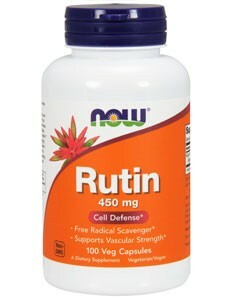 Rutin - 450 mg 100 vegetarian caps. Rutin is a bioflavonoid related to quercetin and hesperidin found in both citrus and non-citrus fruits, as well as other foods such as buckwheat. Rutin is a powerful combatant of free radicals and promotes a healthy inflammatory response. It is best known for its role in the maintenance of cardiovascular health. * NOW® Rutin is vegetarian and derived from a non-citrus source. SUGGESTED USAGE: As a dietary supplement, take 1 capsule 1 to 2 times daily, preferably with food. Caution: For adults only. Consult physician if pregnant/ nursing, taking medication, or have a medical condition. Keep out of reach of children. Store in a cool, dry place after opening. Please Recycle.